A steady flow of twenty-somethings wearing jeans and backpacks entered a room that smelled slightly of fish. They sat down in front of paper plates holding three helpings of pink salmon. The crowd-mostly college students-had responded to a sign outside: "Do you like to eat fish?" 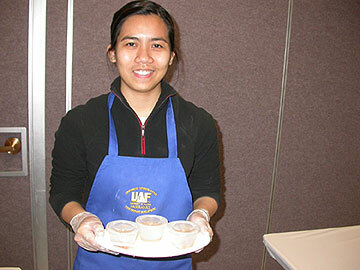 UAF student Trina Lapis holds three samples of pink salmon enhanced with different amounts of fish oil. About 120 people sat down that day at the University of Alaska Fairbanks to rate Alaska pink salmon on such features as saltiness, texture, fattiness, and fish flavor. Perhaps lured by the reward of a few cookies, those fish tasters were helping Trina Lapis earn her degree. Lapis is a master's student in seafood science and nutrition at UAF who wanted to answer a question-can fish processors make pink salmon more attractive to consumers by boosting its oil level? "Of the five species of salmon in Alaska, pink salmon are the highest volume caught but have the lowest value," Lapis said as she portioned salmon into cups for tasters. Pink salmon brought Alaska fishermen about 19 cents per pound in 2007, according to the Alaska Department of Fish & Game (compared to 80 cents for red salmon). Pinks are also relatively low in Omega 3 fatty acids compared with other Alaska species. Lapis and her advisor, Alexandra Oliveira, an associate professor of seafood chemistry with UAF's School of Fisheries and Ocean Sciences, packed about 1,000 cans with pink salmon in Kodiak to prepare for the fish-tasting. They added different portions of salmon oil to the fish; some cans got one-quarter teaspoon, some as much as two teaspoons, some none at all. For four days, Lapis and Oliveira enlisted the help of anyone walking through UAF's Wood Center who wanted to do a blind taste test. I was one of those people, sinking my fork into three cup-size samples of canned pink salmon and cleansing my palate with saltines and bottled water in between bites. My favorite fish had a firmer-than-tuna texture, was not too salty, and had a nice pool of oil in the bottom of the cup for dipping. I rated the three choices of salmon, put my ballot in a box, and collected my cookies. The designers of the study hoped more than 400 volunteer tasters would do the same. "We'll run this for four days, compile the information, and tell the seafood industry 'This is what people want,'" Oliveira said. Pinks, the smallest of the Alaska salmon (averaging about four pounds), are the most abundant salmon in the Pacific. Commercial fishermen have taken about 100 million pinks per year in the state since about 1990, according to the Alaska Department of Fish & Game. Pink salmon returning to their spawning grounds can be so overwhelming that processors stuff pink salmon into tin cans, a fate that higher-fat reds or kings usually avoid because people eat them as filets or steaks. "Pinks have about one-to-four percent fat in their muscle tissue, while kings can have 11-to-20 percent fat," Oliveira said. Kings use their extra oil as their only fuel on migrations upstream that can be several thousand miles. Pinks have much shorter trips back to their spawning grounds. Using fresh pink salmon from Ocean Beauty Seafoods in Kodiak and salmon oil from Alaska Protein Recovery in Juneau (from fresh byproducts such as fish heads, "where all the goodies are," Oliveira said), the researchers are hoping to find a blend that will make people want to buy more canned pink salmon. "There was a time in Alaska when canned salmon had salmon oil added to it, but then came the misconceived notion that all fats were bad for you," Oliveira said. "Adding oil to the canned product furthers its nutritional value. I think it will also improve its taste, but the best way to find out is to ask people."